The ultimate goal of Purdue University Residences is student success. We at UR want to see that success, so we’re holding our second annual #URSuccess contest, where residents capture themselves or others being successful in University Residences or around campus. The winners get sweet prizes, so it’s worth your time. Last year’s winner was a YouTube video of a resident rounding up friends and going sledding at Slayter Hill. Second place was an RA’s Instagram photo of a diversity-themed bulletin board, and the third place entry was a tweeted photo of a jam session in someone’s room in Cary Quad. We saw a lot of cool hall programs and plenty of our awesome dining courts. Posts can be funny, or sentimental, or artistic, or even just a selfie. Post your interpretation of University Residences success on social media with the hashtag #URSuccess and you’re in the contest. 1. An entry can be text, image, video, vine, meme – anything on social media that includes the hashtag #URSuccess. 2. Entries must be posted by March 31, 2015, by 5 p.m.
3. 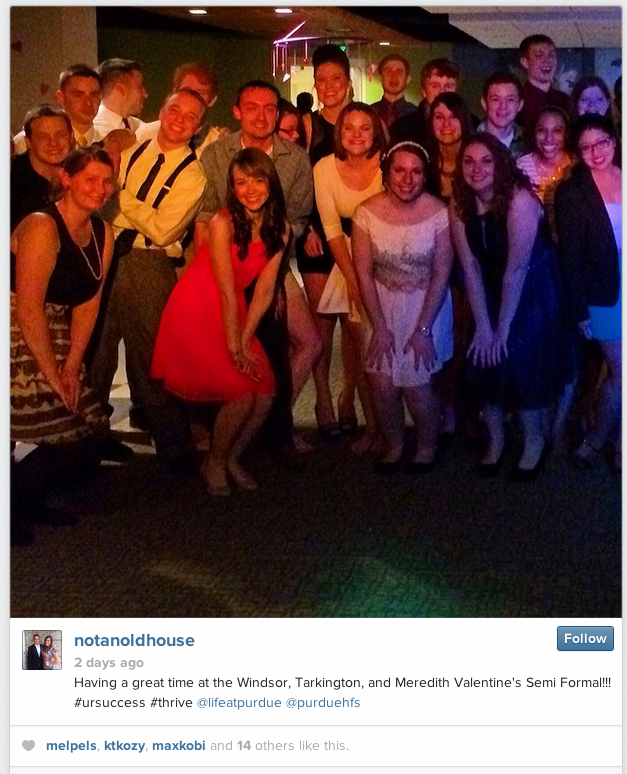 You must be currently enrolled at Purdue and plan to live on campus next year. Only entries posted by students who have signed a housing contract for 2015-16 by the deadline (March 31) are eligible to win prizes. 5. Your post settings must be set to “public” or we can’t see it. We have to see it to give you a prize. First Place: Customized dinner for you and 20 friends at the Athletic Dining Room – you get to work with a Purdue Dining & Catering chef to select your personalized meal! Your favorite foods will be prepared by a professional chef. Second Place: Customized dinner for you and 15 friends in the Windsor Hall Kitchenette, personalized to your tastes and prepared by a professional chef. Third Place: Pizza and milkshakes at Harrison Grillé for you and 10 friends. Winners will be contacted by April 6 through their Purdue email address or the social media platform from which they posted. You will have until April 10 at 5 p.m. to respond to your notification, or your prize will be forfeited. Once you respond, University Residences staff will contact you to coordinate the details of your event, which will take place during the spring semester of 2015. No cash value can be exchanged for your prize if you win. The 2013-14 school year has come to an end! Thanks everyone for making it another great year on campus at Purdue. Take a look at all that went on in res life, from back-to-school cookouts to end-of-year dances and everything in between! First things first, thank you to everyone who participated in the #URSuccess social media contest! The quantity and quality of participation blew us away, enough that we wanted to share not only the winning entries but also a group of finalists who perfectly captured various aspects of success in University Residences. Some entries are funny, some are heartfelt and all are a reminder that living on campus is a dynamic and unique experience. There was singing, there was sledding, and there were zombies. Matt produced a video of snow day sledding on Slayter Hill, getting ready to brave the cold in his room and then joining all the students who trek to Slayter for a day of fun when classes are cancelled. Matt won a customized dinner with 20 friends at the Gathering Place in Meredith Hall, where he will get to plan the menu with a professional chef. 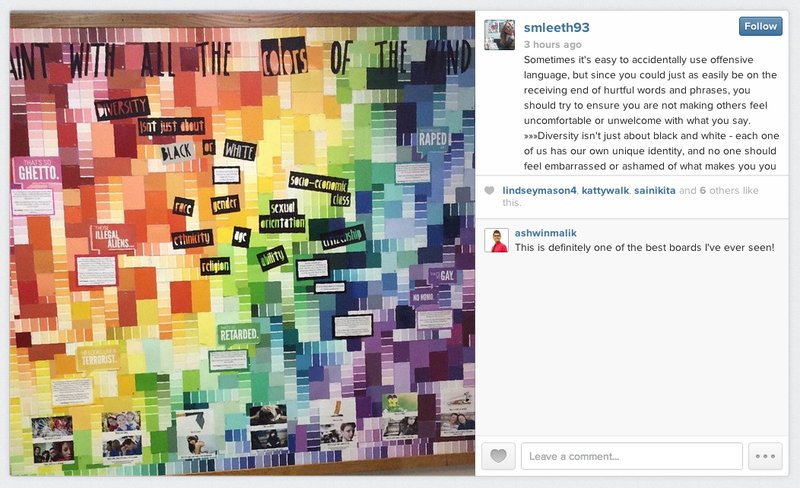 Stephanie is an RA at Hillenbrand who snapped this photo of a bulletin board she designed, which celebrates diversity and encourages students to be mindful of some commonly-used offensive phrases. The second place prize is a meal with 10 friends in the Athletic Dining Room in Cary Quad where the Boilermaker athletes eat. 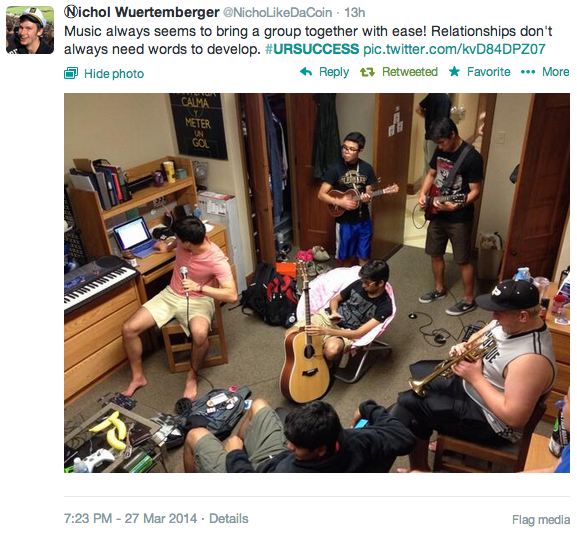 Nichol’s photo is a quintessential res hall experience… Everybody grab an instrument and annoy the neighbors! Nichol’s prize is lunch with 10 friends at the Sagamore Restaurant in Purdue Memorial Union, a favorite food spot of Purdue faculty. 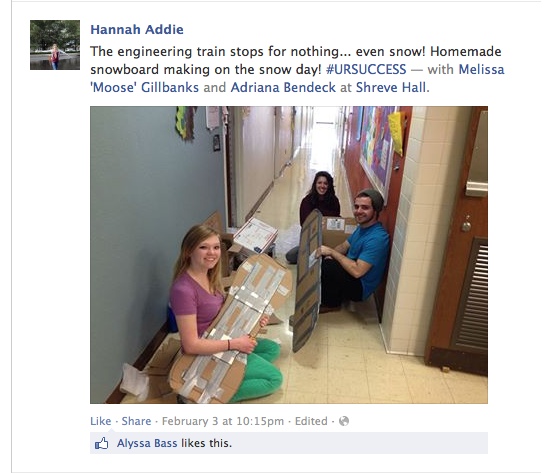 Hannah Addie had two entries as finalists, one of engineering students on her floor making homemade snowboards and another of her RA staff dressed as characters from The Walking Dead. 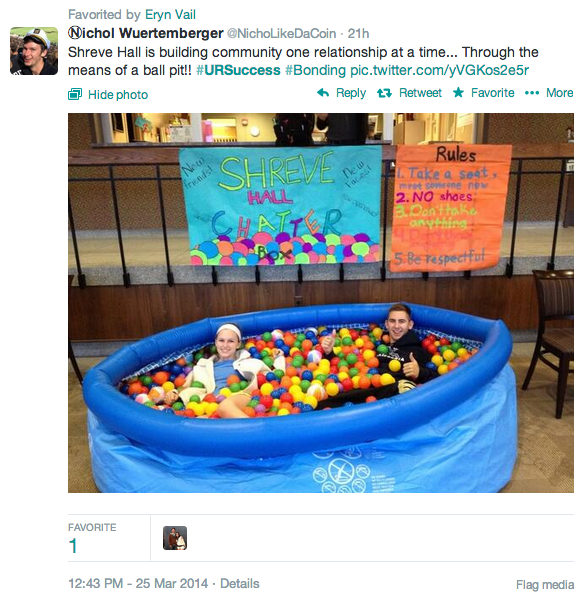 Nicoletta Fala shared videos from several events in Shreve. Forewarning: karaoke. 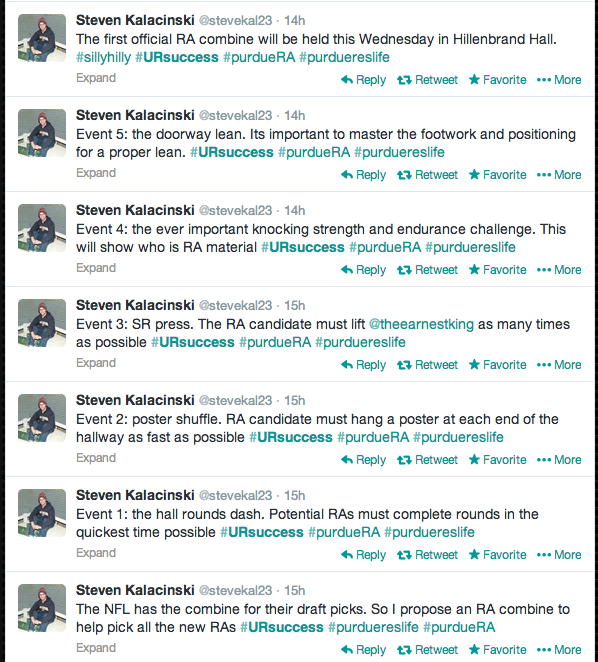 Steven Kalacinski parodied a football training event to create the “RA Combine.” (Read bottom to top for sequential order). Stephanie Leeth shared two videos, one that includes projectile food and the other a song written and performed for an RA. 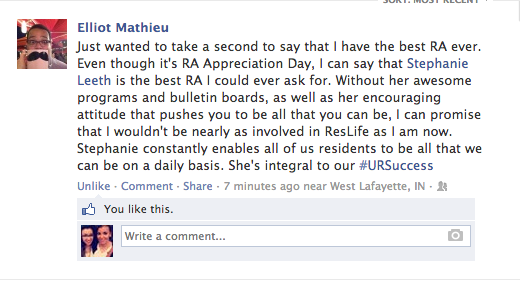 Elliot Mathieu took the time to celebrate his resident assistant on RA Appreciation Day. 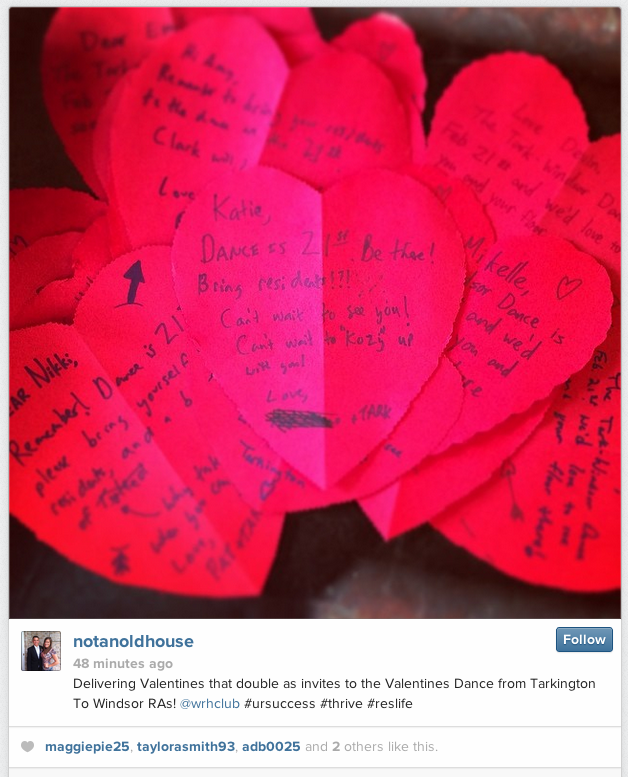 Lorrie Newhouse shared a photo of the hand-made invitations to a Valentine’s Dance from Tarkington to Windsor and then a group shot at the event. 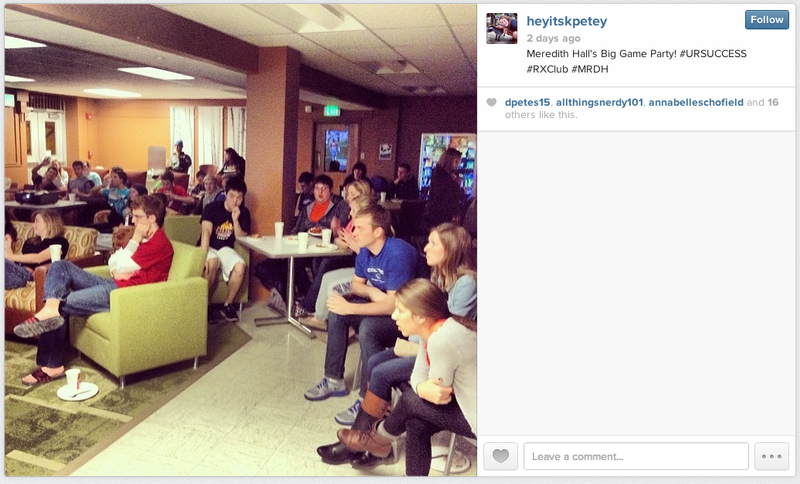 Kelly Peterson captured about half of Meredith crammed into a common room to watch the Super Bowl. Joel Phillips made a compilation video of the dining courts, residence halls and sledding at Slayter Hill. Raymond Riley found his way to the Shreve Chatterbox for a study break. 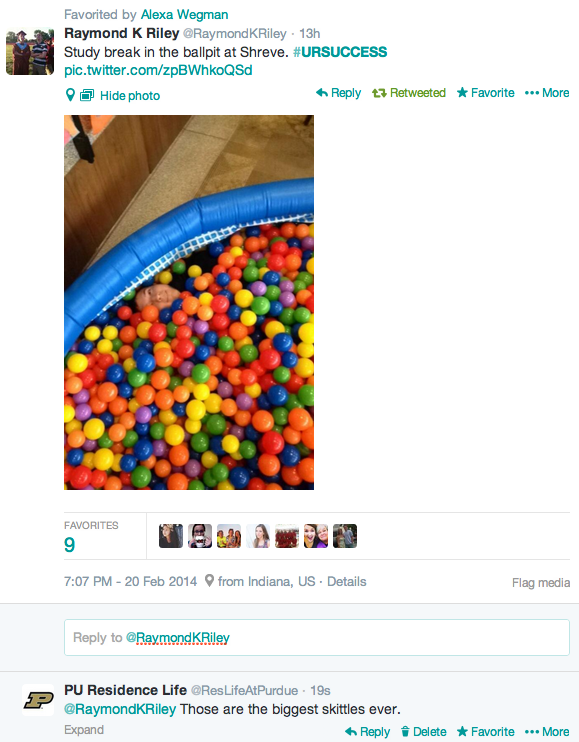 As detailed in our Of-the-Months post from March, the Chatterbox is a ballpit with questions written on some of the balls to encourage students to get to know each other by jumping in and start conversations. 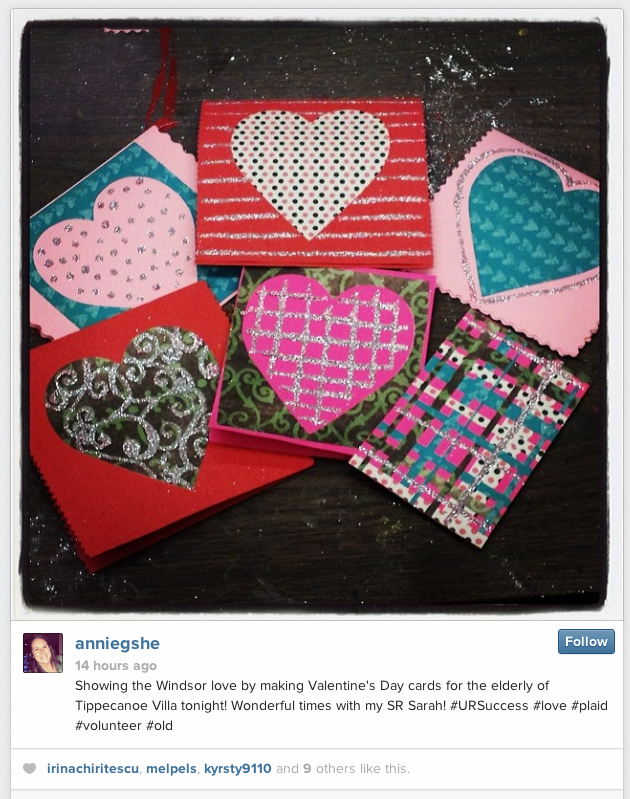 Annie Sheahan shared a touching moment from a program at Windsor, where students sent Valentine’s cards to a retirement village. Nichol Wuertemberger shared another photo of the Shreve Chatterbox, with the guidelines for participation listed on the right. Hannah Young praised the staff of the dining courts for coming to work and cooking during a very snowy winter at Purdue. We want to thank each and every one of our residents for having lived with us this past year. It was a pleasure to have you with us and we are sorry to see you go. We have enjoyed getting to know you, watch you grow, learn and become the amazing individuals you are becoming. We saw many of you move-out this past week, and we look forward to welcoming you back, returning to live with us next fall. For those of you who have chosen to move off-campus, we also want to be sure you are aware University Residences is still committed to serving you as a Purdue student with several of your housing needs. This past year we created a new position – Assistant Director of Off-Campus Housing – for this explicit purpose: To provide an expert to help you navigate a myriad of situations that may arise with off-campus housing needs. University Residences is committed to assisting students in their off-campus housing search. We provide detailed information on area apartment buildings and landlords, including: price, location, and amenities. We also provide a database of apartment listings where students may find suitable housing options. An additional page on Facebook – Purdue Alternative Housing -Student Guide – (must be logged into Facebook to view), allows students to post their sublet or roommate available listings. Information on utilities, renter’s insurance, transportation, and other topics relevant to housing are also discussed during the students housing search. We offer programs that inform our students about their rights and responsibilities as tenants. These programs also include information on living in the community and being a good neighbor. Programs may also cover information students should consider before deciding whether to live off campus, and an overview of the housing search timeline. Our office provides consumer information regarding lease terms and housing code regulations. We also keep sample leases on file and can address questions a student may have before signing a lease. The office, in collaboration with the Purdue Student Government, will also offer a common language lease available for all students to view. Our office serves as an advocate for students dealing with landlord disputes. We can provide students consumer information on their rights based on the housing code. We will also apprise students of their options and encourage them to take a course of action that is in their best interests as a tenant. We will at times make referrals to the Purdue Student Government legal resources that may be available to them as students. No matter where you choose to live, University Residences is committed to serving you. Living on campus or off, we look forward to providing excellence for our students. Have a great summer – stay safe and enjoy every minute! This week I want to talk about all the ways to have a fun, awesome and safe Spring Break. I completely understand the excitement and the “I just want to have fun and not think about anything,” part of Spring Break. This is my first year without one since Kindergarten. Let me tell you, Reality Check! I don’t want to lecture you about what you can and cannot do. I just want to help guide you to prevent some potential Spring Break disasters. Tip #1: Emergency Contacts. This seems simple and redundant but you’d be surprised how helpful and well it works. Pick out two people you would like someone to call in case of an emergency, i.e. hospital, sickness, etc. Let’s say you choose your mom and dad. Put their numbers in your phone as 1Emergency Contact and 2Emergency Contact. The numbers will ensure that the names come up first in your contact list if someone is looking through your phone to find out who to call. Also, if you have a lock designated on your phone it would be wise to turn it off for Spring Break. That way if there is an emergency people can get to your contact information. Tip #2: Destination. Make sure someone knows where you are going at all times. This means if you are going to the pop machine on the next floor of your hotel or to the store down the street, tell one of your friends. This goes along with the “buddy system.” If you’re going somewhere far from your group, take someone with you. Chances are someone will want to go with you. It’s important to remember where ever your destination, you are not at Purdue. You do not know your way around Mexico, Florida, etc. as well as you do Purdue. It’s easy to fall into a trusting mood when you’re relaxing on the beach. Just remember, to think before you act. Tip #3: Drinking. In most Spring Break destinations, out of the country, the drinking age is lower than the United States. If you are of legal age and are going to enjoy some beverages on the beach or at the bar remember these few things. Make sure to drink water in between drinks. 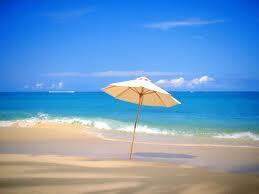 The worst thing in a warm climate is dehydration and alcohol speeds up that process dramatically. Be aware of your surroundings. Unfortunately, not everyone is nice and classy like us, Boilermakers. Some people take advantage of Spring Breakers. Be aware of who is around you and where you are. And last, make sure you buy your own drinks…ladies. This can apply to anyone but I know as a lady it comes up a lot, keeping an eye on your drink and making sure you are the only one to touch it can keep you and your friends safe.